Caffe D'Amore Sipping Cocoa is the ultimate chocolate indulgence, developed by the chocolatiers at Bellagio. A decadent chocolate drink that has a velvety-smooth finish and is made with all-natural ingredients. You only need to add water, milk, or coffee to create a superb chocolate experience at home. 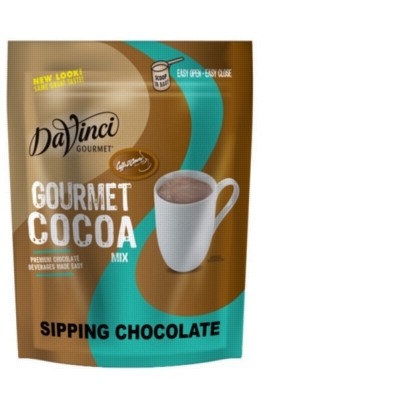 Please note: This product was previously named "Bellagio Sipping Chocolate". It has recently been reformulated* by the manufacturer, DaVinci Gourmet. This updated product has a different bag style, a new name, and an altered ingredient list and nutritional facts (details to the right). MADE ON EQUIPMENT SHARED WITH MILK AND SOY.